Conceived on a very grand scale indeed grand by Colonel William Tighe and his wife Lady Louisa Lennox between 1840 and 1900 the gardens formed the centre piece of a great demesne. As garden comebacks go, there are few more dazzling than the restoration of the grounds at Woodstock. 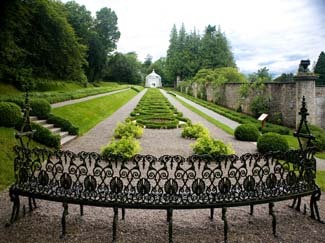 A celebrated show piece in their Victorian heyday, the gardens, gloriously situated above the River Nore, had become a derelict. 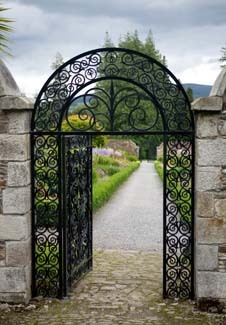 The walled garden had been planted with commercial cherry trees, the statuary was gone, the Turner conservatory scrapped, the walks, rockeries and features overgrown. Now the view down the Flower Terraces, with their dramatic chain pattern replanted with 3,500 box bushes, to Richard Turner’s exquisite domed conservatory looks almost exactly as it did when it was designed by Lady Louisa Lennox in the 1850s. In the 18th C walled garden, where the great double border is planted with old fashioned favourites like campanula,centaurea and monarda, you can almost imagine some of the 50 gardeners who once staffed the grounds at work among the immaculate rows of ruby chard and blackcurrants. And then you can marvel that the 50 acres of core garden are now managed by a permanent staff of five. 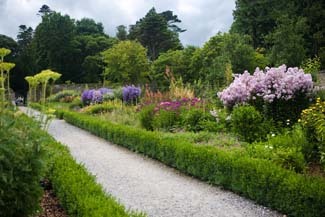 The transformation of Woodstock began following a phased scheme initiated by Kilkenny County Council in 1996 under the Great Gardens of Ireland Restoration Programme. It was the last of the 26 historic gardens to benefit, and staff learnt lessons from those who had gone before, for instance it is a good idea to start work on the periphery, rather than the central features, otherwise the former may never get done. 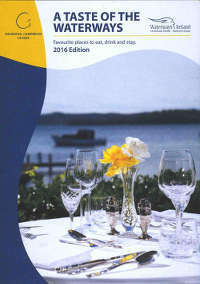 Today the gardens provides a wonderful insight into garden history. The trees planted in the pleasure grounds during the 19th C were much visited exotic novelties. Today some like the coat redwood Sequoia sempervirens and the Himalayan hemlock Tsuga dumosa have grown in size to become European champions. Conceived on a very grand scale indeed grand by Colonel William Tighe and his wife Lady Louisa Lennox between 1840 and 1900 the gardens formed the centre piece of a great demesne. During restoration 40K of paths, (2 meters width was required for two ladies to walk abreast and 1.5 for a lady and gentleman,) were uncovered, an exact replica of the original fountain made and a granite rim sourced from India. The design of the oval rose garden was uncovered, the pretty Gothic pergola recreated and planted with R.’Mme Alfred Carriere’ and ‘ Blush noisette’ the rockery ,made where 50,000 cartloads of earth had been dug out to make the flower terrace, cleared and replanted. 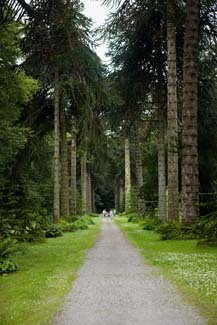 Outstanding features like the 1845 Monkey Puzzle (Auricaria aruaucana) Walk , the oldest and longest in Europe and the quarter mile 1878 Noble Fir Walk (previously lost in undergrowth,) have regained their impact after Herculean work. And features like the rustic Knox’s Bower and grotto which reflect the 18th and 19th century romance with the picturesque have been recreated. 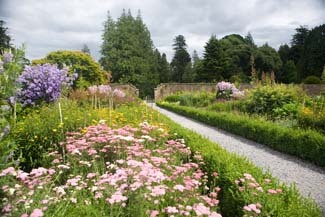 The garden is once again a showpiece for County Kilkenny and now attracts around 30,000 visitors a year and deserves more. A playground was recently added to make the estate more child friendly and there is a tea room in the conservatory. 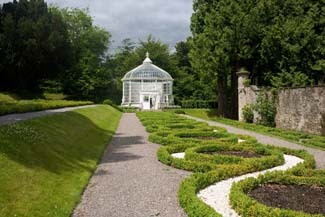 Work was carefully supervised by County Council landscape architect Claire Murphy and Heady Gardener John Delaney and is ongoing and it is hoped one day to restore the elaborate Winter Garden designed by head gardener Charles McDonald in the 1860s beside the 1745 house by Frances Bindon which was burnt in 1922 following occupation by the Black and Tans.